YotaPhone 2 is packed within a premium paper box, which unfolds rather oddly, spreading the entire retail package contents before you. All components, even the SIM ejection pen, are packed with great attention to detail, just like we'd expect from a premium product. The micro USB cable and the single-piece headset use tangle-free wires, which is still rare to see with the competition. There are also lots of complimentary earbuds - Yota made sure there is a pair to suite everyone's ears and then some. Some might say the YotaPhone 2 looks a lot like the Nexus 5 as it uses similar material and has a similar understated looks. The YotaPhone 2 spreads at 145 x 69.4 x 9mm, which is 6mm taller than the unbelievably compact Nexus 5, but the width and thickness of the two are identical. The YotaPhone 2 weighs 145g, which is 15g heavier than LG-made Nexus 5. YotaPhone 2 isn't the traditional smartphone we are used to seeing. Sure, it looks like a generic phone at the front, but the back is an entirely different story. 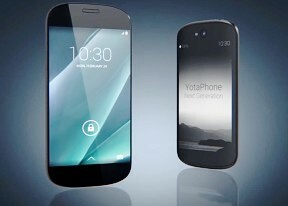 The YotaPhone 2 is built around a matte plastic frame, looking just like the Nexus 5's, while the two displays are protected by respective layers of Gorilla Glass 3. The rear Gorilla Glass 3 shield is curved at the corners. It isn't as transparent as the front glass and has a smoked look to it. It's also matte and even slightly rough to the touch as opposed to the smooth glass surface of the front. In other words, it doesn't feel as glass to the touch. The smoked-like surface may sacrifice some of the screen's contrast, but it looks great and fits the design quite well. The good news is there isn't a single glossy element on the YotaPhone 2 and the gadget isn't prone to fingerprints and smudges at all. It's a sleek and elegant phone, and its matte back boosts both the aesthetics and the overall grip. Handling the YotaPhone 2 is a real pleasure, courtesy of the mostly matte material used on both the frame and over the rear display. We find the minor toll taken on the e-paper display's contrast rather acceptable, because otherwise we'd probably have gotten an all glossy and slippery phone - an awful combination. The front of the YotaPhone 2 is mostly occupied by the beautiful 5" AMOLED screen. The earpiece is centered on top of the screen, flanked by a coupled of sensors and the front 2.1MP snapper. There aren't any controls below the screen, Android OS provides virtual ones instead. The left side of the YotaPhone 2 is completely bare, while the right one houses the volume rocker and the power/lock key. You may notice the small hole on the volume control - the entire thing is ejectable, as it doubles as a nano-SIM bed. The lonely 3.5mm audio jack is at the top of the YotaPhone 2, while the bottom has the microUSB port flanked by two identical grilles - one for the loudspeaker and one for the microphone. Finally, the electronic paper display is the highlight feature at the back of the YotaPhone 2. Above we find the 8MP camera lens and the single-LED flash. You can choose from dozens of widgets for the rear display, you can also set it to show a picture or pictures from your gallery. The display is always on and for the naked eye it looks like a factory print on a rear panel. If you turn off the phone (or your battery dies), the YotaPhone 2 name will continue to be displayed at the rear display, as once the image has been set, the e-Ink screen requires virtually no power to sustain it.